Uncle Joe’s Auto Dealership functions under the umbrella of the famed Family Auto Group in South Carolina. Every facility, every deal, is the same here at Uncle Joe’s as you will find at the other dealerships of Family Auto. We function merely with a different name but our motto is the same as Family Auto’s. That is – We Treat You Like Family. And much more. At Uncle Joe’s, your experience is exactly like the Family Auto dealerships as we are after all a proud extension of the famous buy here pay here dealerships in upstate of South Carolina. 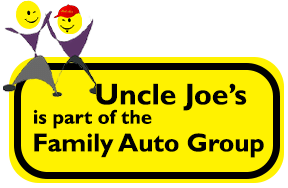 Why choose Uncle Joe’s with Family Auto? The Family Auto Group has been in the auto industry for about 20 years now. The sales people are skilled, the business is highly authentic, and they are not worried about your bad or no credit and can-do easy financing. When you opt for Uncle Joe’s in Spartanburg SC, you are eventually tapping into the massive potential of Family Auto. You get peace of mind, quality used cars and unparalleled financial assistance. Uncle Joe’s and Family Auto is one entity. When you buy from Uncle Joe’s, you are buying Family Auto cars. We serve you with exactly the same customer service that you would receive in any other Family Auto dealership with no compromise on your experience. So, select Uncle Joe’s. Select Family Auto. And drive home a car that you always wanted.